At Inverardran Guest House, we are a warm and welcoming family-run business offering bed and breakfast as well as self-catering accommodation. Set in the gateway of the quiet and beautiful surroundings of the Scottish Highlands, you’ll find great hospitality and relaxation. 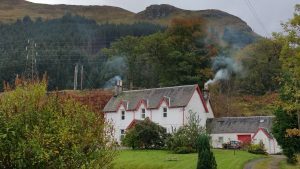 Our traditional country-style guest house is located east of Crianlarich village in central Scotland and is perfectly positioned in the Loch Lomond & Trossachs National Park for your weekend breaks.